There are so many ways to connect these days, and CalHFA is up and running with the best of them. Follow us on Twitter for frequent updates, news bites, and links to helpful information sources. Become our friend on Facebook, and help us spread the word about our programs and initiatives. Watch our video productions and appearances on newscasts by checking out our channel on YouTube. We want to let you know what CalHFA is doing, and we want to know what you're doing. Connect with us today! Stay connected with CalHFA and receive product and program updates as they occur. To stay informed, please register your email address at our web site: www.calhfa.ca.gov (Click on "ENews Signup"). CalHFA Housing Matters is published periodically with the goal to provide stakeholders, customers, and clients with updates on affordable housing issues and highlights of CalHFA programs. Welcome to the winter issue of Housing Matters, CalHFA's occasional update on what's happening in the world of affordable housing. I am pleased to be writing my first Director's Message for the newsletter, as Governor Brown appointed me as Executive Director in mid-2011. Despite the tumultuous times in the housing industry, I'm excited to be leading CalHFA—we have so many opportunities to set a blueprint for many sectors of housing, and I believe there's no time like the present for getting things done. First off, the Mental Health Services Act continues to provide funding for hundreds of multifamily housing units across the state. There are some examples of successes within this newsletter. We're also looking forward to collaborating with other state agencies to conduct a large-scale study of affordable housing costs in California, with big implications for the future. Thirdly, we continue to offer programs for single family housing, with the FHA Targeted Area loan program for first mortgages, and CHDAP and SFF for down payment and closing cost assistance. This is all, of course, in addition to our continuing work with Keep Your Home California, our commitment to energy efficiency and our other initiatives that help Californians find and stay in homes that they can afford. I hope that you and your loved ones had a warm and safe holiday season, and I'm looking forward to a prosperous and productive 2012. CalHFA continues to offer first mortgages in Federally Designated Targeted Areas, in addition to down payment and closing cost assistance programs. They may be just what you need to make a homeownership dream come true. Federally Designated Targeted Areas have become key to doing a CalHFA loan, yet many people simply do not understand what they are or how to locate them. Targeted Areas are designated by the U.S. Department of Housing & Urban Development and the U.S. Treasury Department to encourage economic growth. Generally, these are areas where the government wants to stimulate development: urban cores, infill and other up-and-coming locations. They are defined by census tract as well as other criteria set by those departments. What are the benefits of a Targeted Area? Borrowers who purchase a home in a Targeted Area are allowed to use higher income and sales price limits. Most importantly, CalHFA borrowers in Targeted Areas do not need to be first-time homebuyers. How do I find a Targeted Area? 1. For a county-by-county list of Targeted Areas, visit CalHFA's Targeted Areas web page. 2. Once you’ve pulled up the list, click on any census tract number to bring up a map of that particular Targeted Area. 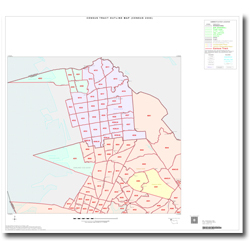 The map here shows several tracts in Alameda County. 1. To enter the address and get a census tract number, or “Tract Code”, visit www.ffiec.gov/Geocode/default.aspx. 2. Refer back to our list of Targeted Areas to see if that Tract Code and County are on the list. For a more complete discussion of Federally Designated Targeted Areas, refer to our web site. To learn even more about Targeted Areas, you can look at the CalHFA FHA (Targeted Areas) program handbook Good hunting! The California Homebuyers Downpayment Assistance Program offers up to 3% of the purchase price of the home for first-time homebuyers, and is available with any first mortgage loan that meets CHDAP's underwriting requirements. This program, funded by Propositions 46 and 1C, has helped more than 20,000 first-time homebuyers. The School Facility Fee Down Payment Assistance Program offers help for people buying a newly-built home. There are fees associated with many new homes, among them a fee to help build schools near the new home. The SFF program returns this fee to the homeowner through a conditional grant, usable for any costs associated with the purchase of the home. The average grant is close to $5,000, and the grant has helped more than 13,900 families, so it's definitely worth taking a look! During late 2008 and early 2009, state and local housing finance agencies lobbied Congress and the Obama Administration to support the housing market through the federally-backed purchase of tax-exempt housing bonds. As a result of these advocacy efforts, the administration created the New Issue Bond Program (NIBP) in October 2009 to provide affordable housing bond funding to CalHFA and other housing finance agencies. This funding allows developers to secure a source of affordable financing in the marketplace which otherwise could not be obtained. A major requirement of the NIBP was that the loan be credit-enhanced via Freddie Mac, Fannie Mae, or the Federal Housing Administration. This credit enhancement meant that fees were lower than much of what was available in the market, and the enhancement allowed projects to move forward that would have otherwise needed to find additional sources of financing. To date, the NIBP has provided funding for 22 projects in California, representing 2,809 units of affordable rental housing. In late November 2011, the US Treasury approved an extension of the program into 2012, allowing unused single family allocation for single family or multifamily projects. CalHFA looks forward to working with housing partners to continue using this funding and expanding affordable housing opportunities in our state. California continues to struggle with the overall cost of developing affordable multifamily rental housing, as do many other states and localities. Subsidies per unit continue to increase, while access to financing resources, for affordable multifamily rental housing, remain uncertain. Due to these factors, examining and maximizing efficiency of cost components is critical. There are many different organizations, both public and private that have influence on these cost components, which include land, local requirements, permit fees, development fees, construction type, scale of project, prevailing wages, location, brownfields and housing policy program requirements. Studying these cost components and figuring out the best way to use them in conjunction with each other is not a simple task. Fortunately, California state agencies are known for their ability to work with each other to solve large multi-jurisdictional challenges. The California Housing Finance Agency, along with the California Department of Housing and Community Development, the California Tax Credit Allocation Committee, and the California Debt Limit Allocation Committee are collectively undertaking a large scale study of affordable housing development costs within California. A primary objective of this study is the collection of cost data, methods of comparison and trends, coupled with rigorous analysis to produce a comprehensive report on affordable multifamily rental housing costs. An additional component of the study is to develop policy recommendations for the evaluation, monitoring and containment of these development costs to better promote the supply of affordable housing. The agencies expect the report to be completed in the fall of 2012. The Long Beach Courtyards, built with the assistance of more than $4 million from Mental Health Services Act funds, was recently named Special Needs Housing Project of the Year for 2011 by the Southern California Association of NonProfit Housing. The project has 46 units in four separate locations, including 23 units set aside for MHSA target population adults, and was completed in December 2011. Dr. Raye Richardson Apartments (in San Francisco, also funded with MHSA money, opened in September of 2011. Of the 120 total units, 12 are set aside for MHSA adults. The project combined financing from eight different sources, and was developed by the Community Housing Partnership and Mercy Housing. The one year anniversary of Keep Your Home California's full implementation is approaching and there have been some important updates in recent months, allowing even more homeowners to take advantage of one of the four mortgage assistance programs. The programs are federally funded as part of the U.S. Treasury Department's Hardest Hit Fund, and are aimed at helping low and moderate income homeowners struggling with financial hardships. Keep Your Home California has committed $200 million as of December 2011 to help approximately 10,000 households avoid foreclosure during this first year. In November 2011, a series of program updates were implemented to make it easier for homeowners in need of assistance to qualify. Homeowners who refinanced and took cash out, in addition to those who own additional properties, are now eligible for assistance. Additionally, the amount of time households could receive funding from the Unemployment Mortgage Assistance Program has been increased from six months to nine and the maximum funding available through the Mortgage Reinstatement Assistance Program was increased from $15,000 to $20,000. It has also become easier for homeowners to find information about the programs. Keep Your Home California has increased its social media presence with active Twitter, Facebook, and YouTube accounts where updates are posted on a daily basis. The web site has been re-designed to be more user-friendly and a Keep Your Home California blog has also been established. While there are still many families struggling during the ongoing foreclosure crisis, Keep Your Home California made great strides towards helping Californians remain in their homes in 2011 and the progress is expected to continue in 2012 and beyond. For more information, please visit www.KeepYourHomeCalifornia.org. The onset of winter is the perfect time to check up on your home's safety, upkeep and energy efficiency. It'll give you peace of mind, and probably save you a few dollars in the bargain. Here are ten easy things you can do now to make sure you're ready for the cold, wet weather. 1. Clean your gutters. An hour or two with a scraper and some gloves when it's dry will save you several hours and many unpleasant words when it's wet. 2. Look for leaks. According to the EarthWorks Group, the average American home has leaks that amount to a nine-square-foot hole in the wall. Any crack is worth sealing. 3. Insulate, Insulate, Insulate. An easy rule of thumb: If you can see in a joist in your attic, you need more insulation. 4. Keep your furnace happy. If it's more than a few years old, you should have it tuned. And replace those furnace filters monthly—when the heat's on often, they get very dirty very fast. 5. Don't duck your ducts. The US Department of Energy says that a home with central heating can lose up to 60% of its heating if the ducts aren't up to snuff, or pass through unheated areas. Get them checked. 6. Chim-Chimney-Chim-Chim-Cheree. Make sure the damper's closed when you're not using it. Find yourself a certified chimney sweep through CSIA.org. And don't forget to check for your area's burn status so we can all breather easier. 7. Turn the fan around. There's a little switch on your ceiling fan that reverses its direction. Flip it so when you look up, the blades are going clockwise. This helps warm air circulate better. 8. Don't let your pipes freeze. Drain lines to the outside if freezing nights are forecast. You can get pre-molded foam or fiberglass for exposed pipes at the hardware store. 9. Test your smoke alarms. Otherwise, the batteries always seem to die at 3am. 10. Make sure you're always prepared. Candles, hand-cranked lights, extra food and water, first-aid kit. Although California is pretty nice, we still get floods, blackouts, and other emergencies; you want to be ready.